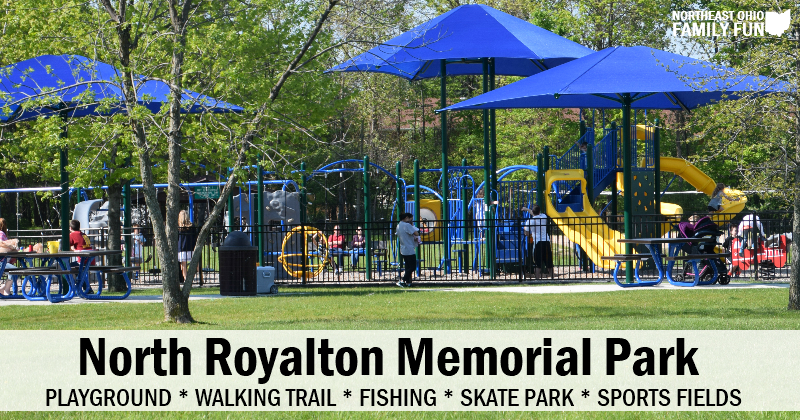 Located behind the North Royalton City Hall, Memorial playground has something for all ages and interests including a large fully enclosed playground, fishing pond, paved walking trail, skate park and many other sports options. The playground is completely enclosed and consists of two play areas. One geared for older children that has multiple slides and climbing structures, and one with a smaller play structure that is great for toddlers and younger children. The playground also includes a swing set with both infant and regular swings. A short walk from the playground is a large lake, with a bridge over part of it. You are allowed to fish from the shoreline. There is also a paved walking trail that winds around the park, multiple sporting options including basketball, volleyball, tennis and skate boarding. Because of the layout of the playground, you can easily see the whole thing from wherever you stand. This makes it easy to keep an eye on multiple children playing in different areas. The fact that it is fully enclosed also keeps children from wandering off. 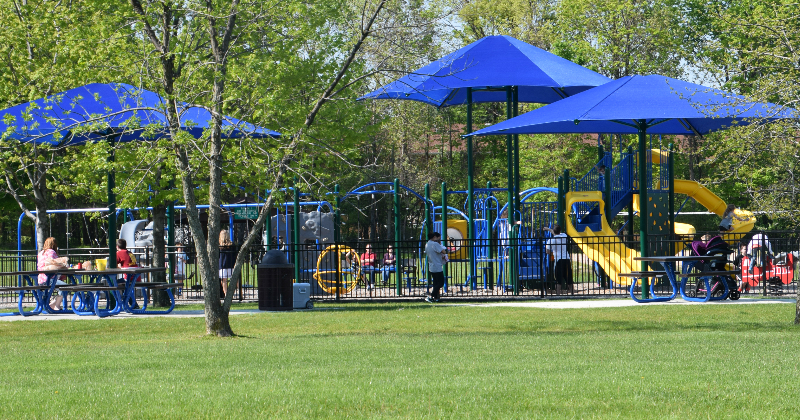 While there is a canopy over part of the playground, there is not much shade. Plan to bring a hat or sunblock to protect yourself and your kids from the sun. There are a group of picnic tables located next to the playground. They have a shade which is really nice. The paved trail is perfect for strollers and the path winds around the playground and lake. You are allowed to fish from the shoreline of the lake. Have Tips or Comments About North Royalton Memorial Park & Playground? Leave a comment below to let us know. Thanks!